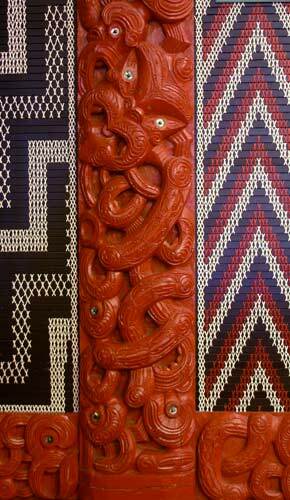 This carving at the Victoria University of Wellington marae, Te Herenga Waka, depicts Tānenui-a-rangi, an important figure in Māori mythology. Among other things, Tāne was responsible for separating earth and sky and for fashioning the first human. In some traditions Tāne ascended to the highest heavens to obtain the ‘baskets of the wānanga’ (knowledge, understanding, wisdom) and bring them to humankind.